Story and photos by Pam VanderPloeg unless otherwise noted, copyright 2018. I read somewhere that a couple who owned a Frank Lloyd Wright home but could no longer get along, refused to get a divorce because neither wanted to lose the house. It’s funny how attached you can get to a house. When Bruce and Cindy Joldersma decided to downsize in Spring 2018 to a condominium in Holland near their grandchildren and their sailboat, it was a bittersweet decision. It required selling their right-sized David Post-designed modern house that stands out in a neighborhood of colonial, English Tudor and more traditional ranch homes. The soil on this site was challenging. Post perched his bi-level house, with a full walkout basement, back as far as he could on the edge of the steep ridge. He designed a two-story window wall on the back of the house to take full advantage of the views of what is today the Maryland Estates Association nature preserve. He added a narrow balcony/deck that had decorative horizontal boards. He sided the exterior with vertical California redwood. He designed the front of the house with a low, you might say understated, horizontal profile and a nearly flat tar and gravel roof (the pitch has a 1 to 12 ratio). A half-circle drive curves in front of a set of awning windows and ends in a California-style carport. The carport is of course, a functional space, but it’s a design element too with decorative redwood boards that echo the back balcony. Remarkably, past owners have resisted the urge to replace it with a garage. An early black and white photo captures the original design. Sometime around 1968 the Post family decided to sell the house in favor of a bigger house in the Ottawa Hills neighborhood. In fact, it changed hands a few times before 1972 when it became the first home of Bruce and Cindy Joldersma who were just 24-years old at the time. They have been good stewards of the home during their 45 years of ownership, gently altering and expanding the house, while determinedly preserving its mid-century style. I visited the Post-Joldersma House twice, once in August 2013 after I met Bruce and Cindy at a lecture I gave on the subject of Grand Rapids mid-century modern homes. The second time was in October 2017. On that visit, as we made our way from the front door through the living room and into the great room for coffee, my impression once again was of the abundance of beautiful wood, an amazing amount of it. We stopped in the great room, in front of the window wall to look down on the impressive garden. The landscaped yard stretched out beyond the bright red garden sculpture toward the shared neighborhood park and pond in the distance. This house has been well-maintained. Although the window wall is original, it has been updated with newer glass doors, wood surround and a new glass transom. Against that wall is a lovely library-style table with carved legs paired with modern plywood chairs, and on the east wall is a seating group facing a large shelving system displaying books and media. Opposite the windows is the interior full-height brick fireplace wall with cozy seating. The other side of that wall is the kitchen and there is an entry to it from the great room. The house is laid out in four-foot modules using post and beam construction. The tongue and groove ceiling is most likely of pine or cedar. The floor in the great room is a neutral wool carpeting that flows seamlessly between living room and great room. Aside from the fireplace and window wall, the remaining interior walls are paneled in perfectly-preserved clear heart redwood, a reminder of the accessibility of high-quality woods in the 1950’s. Premium grade California redwood is no longer as readily available or affordable today, and in fact to keep costs down, builders will often mix the grades creating a less uniform look to exterior and interior paneling. Redwood paneling also covers the hall between the great room and carport entry, and the stairway leading to the walkout-level bedrooms. Some of the redwood panels are 16-feet long and seamless. The modern design aesthetic particularly appealed to Bruce, an artist who worked for Herman Miller as Director of Textile Design and Development, and taught classes at Grand Valley State University and Calvin College. He created the textile art on the fireplace wall and other works throughout the house. Cindy, like Bruce, has a natural affinity for modern design. She is a retired teacher and her family has bought its share of mid-century homes with a modern edge. After Cindy was married, her parents moved into one of Grand Rapids early California-style ranch homes on Manhattan SE designed by popular builder James Bronkema. Her uncle, Edgar Boeve, headed up the first art department at Calvin College. Cindy and Bruce celebrated their wedding at her uncle’s home, another modern James Bronkema house on Fultonwood Drive SE, an enclave of six modern Bronkema homes and one Carl Koch pre-fabricated house. Bruce and Cindy love the scale of their house. However, when child number three was on the way in 1978, they decided to add on to the west side of the house to create a new formal entry and living room. Here the Joldersma’s collection of iconic Herman Miller furniture is artfully arranged including the Eames lounge chair and rare George Nelson brown leather sling sofa in the living room that is promised to their son after the sale of the house. Collectors that they are, they actually have a twin of this sofa saved for another son. When they completed the addition, they used the redwood paneling salvaged from the original west wall in the living room to match the rest of the house. They also extended the window wall and replaced the original balcony on the back of the house with an expansive deck. They then furnished the deck with multiple tables and comfortable outdoor furniture for the many gatherings they host for family and friends. The vaulted ceiling adds drama to the galley kitchen. The window wall lights up the sleek maple cabinets, modern pulls and porcelain counters. The interior brick wall and stove backsplash, along with the newer tile floors, add to the assemblage of natural materials. The original awning windows provide a kitchen-framed view of the neighborhood streetscape. From those kitchen windows, you would have seen David Post 1950’s Thunderbird parked in the drive. Years later, Post’s architect son, Mark Post, parked his own cool little sports car in that same drive when he stopped by to see his old family home and share some memories with the Joldersma’s. Recently I was able to talk with architect Mark Post who gave me the black and white photo of the original 1955 exterior. Mark fondly remembered the early days, when the Posts lived in their brand new modern home. The family grew from two sons to four and they all shared a room. The family didn’t divide the boys’ bedroom into two to create a third bedroom until they put the house up for sale. At that time, the upstairs floor plan was also configured differently. The great room was a living room, and the room was divided in two by a partition wall to create his father’s, architectural office. Post launched a solo practice from his new home office, and along the way formed two firms, Post & McMillan and then Post, McMillan & Palmer from 1961-1964. He then established Post Associates, the firm that continues today under the leadership of son Mark Post and grandson Andrew Post, with offices in the historic Michigan Trust Building. During his career Post served as a Director of the Michigan Society of Architects and served as President of the Grand Valley Chapter of the American Institute of Architects. David Post won an award in commercial and industrial design for the Union Bank Branch Building in Grand Rapids. Post Associates designed many branch buildings for Union Bank. David Post designed many Union Bank branches including one that won a commercial and industrial design award from the AIA Grand Valley Chapter. He owned a few of them as well. A partial list of Post’s buildings includes the IBM Building on Cherry Street, the Words of Hope Building on Ball NE, the Salvation Army’s Men’s Social Center on East Fulton and the Light-Metals Factory Building in Wyoming, Michigan. David Post designed Hope Reformed Church, East Paris Christian Reformed Church, North Park Baptist Church, the Wesley Park United Methodist Church and the Grand Rapids Community College Learning Center. He also designed several Midwest department stores in Chicago and Minneapolis, and a Demery’s Department Store in Birmingham, Michigan. Post served on several community boards, and was President of the Board of Education, steering the school district through turbulent times when the Grand Rapids Schools was implementing school busing in the late 1960’s. Mark Post recalled the confident father who brought the family to Chicago, and then, tucking some rolled drawings under his arm, tried (unsuccessfully) to talk his way into the Hancock Building construction site. Mark described a father who led a well-rounded life as a dedicated and hard-working professional who loved to read, and cherished family time at their Lake Michigan summer cottage. In his later years, David Post delved into genealogy, taught himself Dutch and traveled to Groningen, the Netherlands to track down his ancestors. The young Post family breathed life into the modern house on Academy when it was first constructed in 1955. From 1972 until now, the Joldersma’s basked in the home’s design aesthetic. They cherish the small details of their life there, like the pleasing sound of rain on the roof and the joy of arranging their growing collection of Herman Miller furniture. They nurtured their three children in the close-knit Maryland Estates neighborhood where families played together and skated on the pond in winter using a Herman Miller chair to keep from falling on the ice. Like the Posts, the Joldersma’s will now pass the home on to new owners. They hope to sell the house by spring 2018, and that, no doubt, will happen since the homes in this Marywood Estates neighborhood rarely even hit the market before they are sold by word of mouth. The ending to this story is really another beginning. 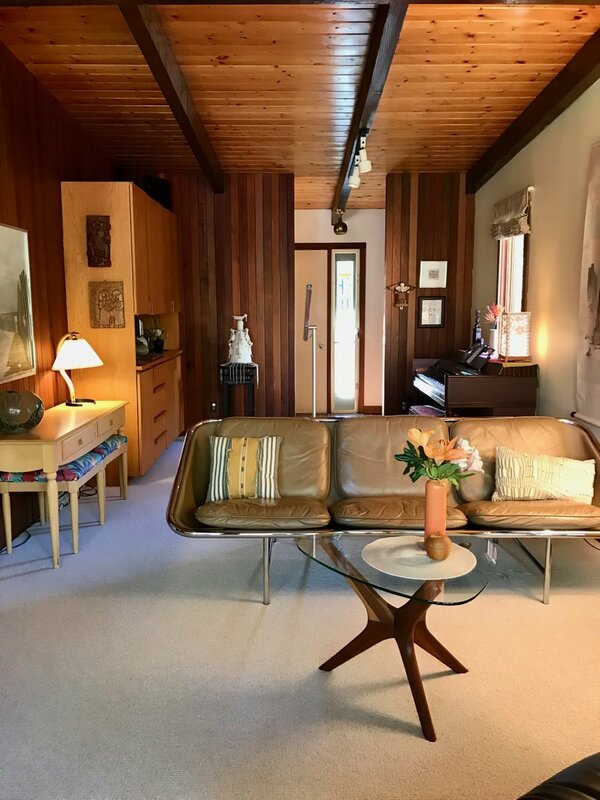 David Post, who designed the home, and the Joldersma’s, who nurtured it, could ever have anticipated the intense interest and enthusiasm today for the mid-century modern style this home beautifully represents. Look for "POST - MODERN" in Grand Rapids Mid-Century Architecture: Guidebook and Map by Pam VanderPloeg available to order on this website June 30, 2018. EARLY PHOTO - DAVID POST ON THE LADDER?